While many factors impact our ability to deliver effective care to our patients, positioning is one of the simplest, but most meaningful interventions we can provide. Different positions help to facilitate different interventions or physiological processes. Supine: Facilitates abdominal assessment & spinal protection. Prone: Helps optimize ventilation for patients with ARDS. Fowlers: Supports normal physiological respiration. Lateral recumbent (Sim’s position): Allows passive airway clearance in the unconscious patient, facilitates inspection of posterior surfaces. Lithotomy: Facilitates lower abdominal surgery, pelvic surgery & childbirth. Trendelenburg: Supports blood pressure and central perfusion. Reverse Trendelenburg etc…You get the picture. 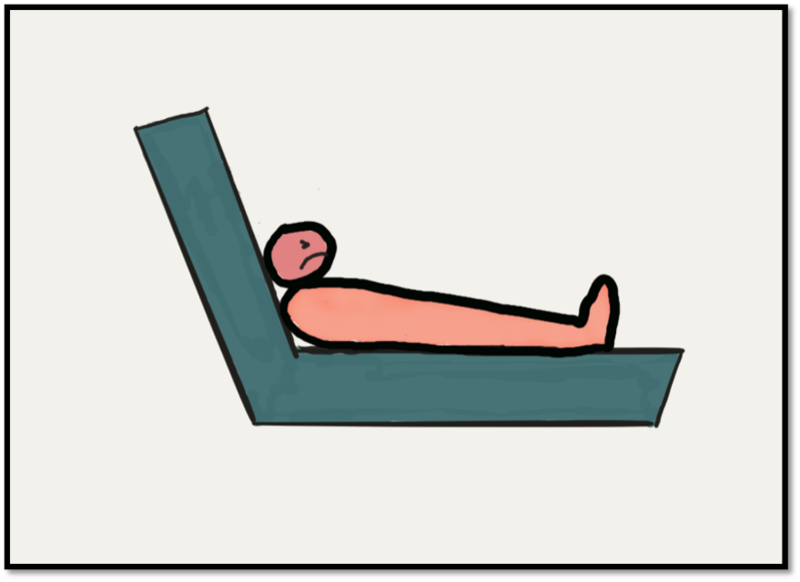 Among the many positions patients find themselves in within the confines of a hospital bed, there is one common position that continues to confound clinicians and hinder the provision of optimal care to patients. I call this position – the crunch. This position occurs most commonly when a patient is positioned sitting up in bed (the fowler’s position) and gradually slides towards the foot of the bed. While the fowler’s position is great when the patient’s backside is in good contact with the mattress, it can cause problems when the patient begins to slip. As the patient drifts towards the bed-end their lower back rounds and their neck invariably begins to flex causing a reclined kyphotic posture that feels as awful as it looks. For conscious, independently breathing patients – sitting up in bed (in the fowlers position) is an optimal position to facilitate ventilation and maintain airway patency. When the patient slides downwards and ‘crunches’ themselves in the angle of the bed, the alignment of the airway and respiratory anatomy becomes less favorable. ‘Crunching’ patients is bad for a number of reasons. Primarily the combination of neck flexion and thoracic rounding provides one of the least optimal physiological environments for breathing imaginable. Secondarily, to get into this position in the first place the patient has to slide down the bed, which implies the application of a shearing force to their backside that over time sets the scene for a pressure injury. This position is also fairly rubbish for other activities like eating & drinking, taking meds or vomiting as the alignment of the GI tract and airway make choking and aspiration real considerations. Slide sheets left under patients for long time. In order to avoid this situation we need to be mindful of our patient positioning. While the fowler’s position is one of the most common and useful positions for the bed-bound patient, the use of simple bed manipulations like raising the foot of the bed or bending the knees slightly can provide some much needed resistance against the eternal pull towards the floor. While slide sheets make our life significantly easier when actively moving patients, they can hasten a patients slide away from their ideal position if they are left in place constantly – not to mention the discomfort factor of lying on multiple layers of nylon and linen. If you recognise this position in your unit, be sure to intervene and assist the patient up the bed. ‘Un-crunching’ patients not only helps to ensure comfort and dignity; its also a simple, effective and often overlooked way of optimising your patients anatomy to facilitate better ventilation while reducing clinical risks like aspiration and choking. Remember that a simple transfer up the bed can be the most meaningful thing you can do when troubleshooting a patient with dyspnoea – sometimes the simplest thing to do is best. An article from American Nurse Today dives much deeper into the causes and management of ‘patient migration’, Check it out at the link below if you are that way inclined (https://www.americannursetoday.com/sliding-patient-respond-prevent-migration-bed/).